Billed as a first-person horror-themed, escape room-esque game, I was intrigued. 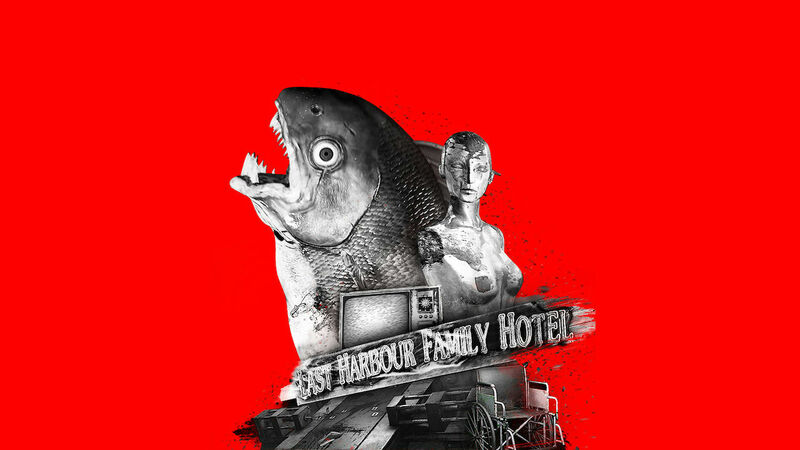 Then I saw the main image for DYING: Reborn, a big fish head on a man’s body and thought “what have I got myself in for.” It looked utterly ridiculous, leading me to believe that it was more of a tongue-in-cheek kind of horror game, not really taking itself seriously. It definitely is trying to be serious, even though it is not necessarily a scary game (we will touch on that a bit later). The game opens up with Matthew, the game’s protagonist, waking up in an unusual room, one whereby there is seemingly no way out of as all of the doors are locked. You have no idea how you got here, but you soon learn that Matthew’s mission is to search for Shirley, his sister, who has been taken hostage by ‘The Guide’, a peculiar masked figure who appears on television screens throughout and tells you what you need to accomplish in order to progress on. It bears a resemblance to the Saw movies, in that somebody else has all of the power and has all of the control. You cannot say no, as there will be consequences. Initially, there is a sense of eeriness, as you have no idea what to expect. It also happens to have some genuinely decent sound design choices (note I said some), which helps increase the tension. It is not long before that initial moment wears off, however, and you see many of the flaws the game possesses. DYING: Reborn never truly becomes a scary game and the reason for this is you learn quite early on that there is no way of dying, which is somewhat ironic when the game literally has the word ‘dying’ in its title. There are no moments of panic as you escape from enemies or are required to defeat them, so any ‘scary’ moments have to be created from elsewhere and it is just not there. Sure, there are some jump scares here and there, which might startle some, but they just seemed somewhat cheap to me. The slow nature of DYING: Reborn would usually help in a survival horror title, but it doesn’t, as its too slow. Even by pressing the left trigger, which allows you to move faster, it is not enough. Moving the camera is even worse, if you want to turn your character fully around, you might as well find a new hobby as it takes an absolute age. My patience with it started to grow thin. There is a lot of reading here too and it does not help the already slow nature. You are unable to press a button to jump forward to the next line of dialogue neither, which means you have to just sit there waiting for it to go to the next line itself, which also takes longer than it should do. You can skip it altogether, but then this means you miss the entire cutscenes, but I guess that could be a blessing. It also happens to have some very bad writing, which seems to be mainly down to translation issues. It all becomes a little comical at times. As you are slowly walking around the game world, you need to check every inch of the room you are in, looking for items to assist you in escaping. These items will be used, in one way or another, to unlock something that gives you another item, which will then help you get another item and so on. Items have the capacity to be combined, too, such as finding different parts of a screwdriver and then having to assemble it back together again. The puzzle sections are where the game shines brightest. While there are certainly some infuriating and downright dull-witted puzzles in here, others are clever, well thought out and thoroughly enjoyable to figure out. An early one involving a piano sticks out in my mind and it gave me a lot of satisfaction when I worked that one out. It is just a shame that those moments are very few and far between, if it had more of these rarities, then it could certainly right some of the wrongs. As it is, you feel like you have to slog through the dull puzzles to get to the infrequent brilliant ones. As it is with all games like these, because the puzzles have only one solution, it means that you are only ever going to play through the game once, as you will know the solution to every puzzle. Again, it is not necessarily a criticism of the game, more so the genre. The only way to combat this would be to have some puzzles that have more than one answer or answers that could change on each playthrough, such as different number combinations. Each of the levels are quite small in size, which I think helps. It means that none of the puzzles are overly lengthy. So those bad puzzles I was on about earlier, it’s not going to take you an age to get past them unless of course, you get stuck. Overall the game runs fine on the Nintendo Switch in both handheld and TV modes. There is the added benefit of touch controls on Switch too, but with weird choices. You are able to select some things using touch, such as the load game icon, but as you then bring up the load menu, you then have to move back over to the face buttons to actually select it. It is not a major issue by any means, but why implement touch screen controls if they only work for half of the process? DYING: Reborn had the potential to be a decent game. Nevertheless, with its lack of real horror elements, bad translation issues and nowhere near enough good puzzles, all of the things you would want, it is hard to recommend. To stand out from the crowd on the Nintendo eShop nowadays, you have to do something different or something special. DYING: Reborn does neither. There are much, much better options out there.